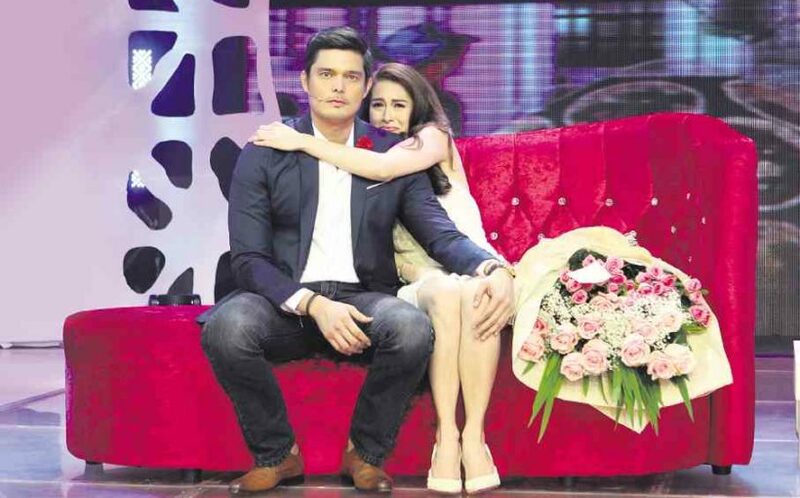 MANILA – Primetime King Dingdong Dantes surprised his one and only Primetime Queen Marian Rivera by proposing a marriage during the live telecast of a dance show “Marian” on Saturday, August 9, 2014. Marian emotionally accepted the proposal of her lover which will fulfill the long awaited wedding of the Royal Couple. Dingdong made sure to propose during the birthday celebration of Marian where his mother, grandmother and other family members and close friends witnessed the sweet yet very emotional event in the Philippine TV right now. The actor set up the whole event by interviewing Marian while showing some images and video footage of them. By that time, the actress bursts into tears. According to Marian, she is ready and much more willing to give Dingdong everything, including countless children in the future even if that will make her body not into shape anymore. Before the proposal occurred in the dance show program, Marian says that the actor kept on avoiding any communications with her but now she knows why. Dingdong explained that the #LastDance will be the last dance of Marian before she changes her name to Mrs. Marian Dantes. On behalf of our news media blog staffs, we would like to congratulate Mr. Dingdong Dantes and Ms. Marian Rivera as the newly-engaged ‘Royal Couple’. May all your wishes come true.